Supervisors can log changes such as sick days or early releases, view agent schedules, and send popup and email messages with a click from the same grid without navigating to different screens. 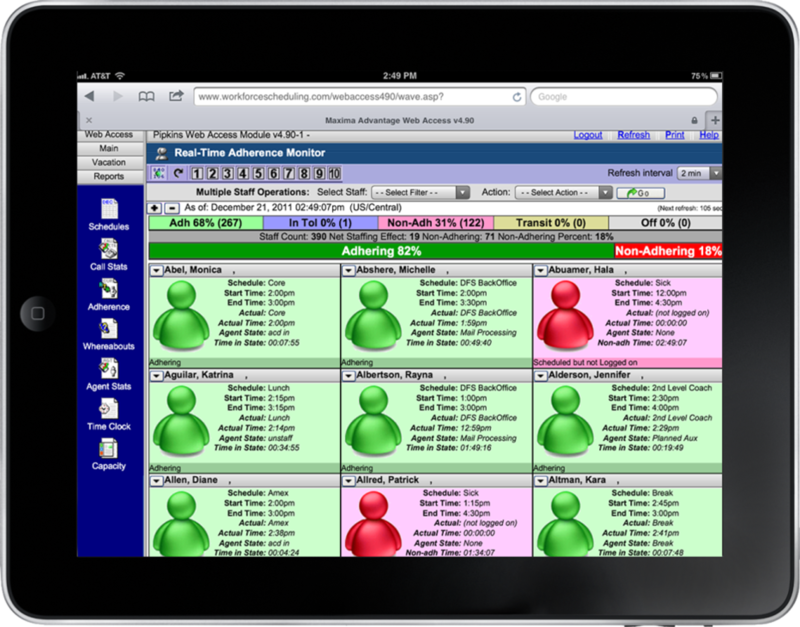 Reports such as staffing effect summaries, adherence summaries for individual agents or the entire staff, and scheduled and actual activity summary graphs are available from the same control screen. Leverages your smart phone or tablet's display and touch controls to deliver remote browser-based access to the full functionality of the WebAccess module, including both the graphic interface and one-click update capabilities. Displays graphical layout in the proper horizontal orientation as well as color-coding for identifying out-of-compliance agents. Drills down to the fine details in highly readable text, and allow supervisors to access information or make schedule changes simply by touching a finger to the screen. One-click report access enabling supervisors to retrieve staffing effect summaries, adherence summaries for individual agents or the entire staff, scheduled and actual activity summary graphs, and other reports from the adherence screen. Reports can be configured to dock or pop up. 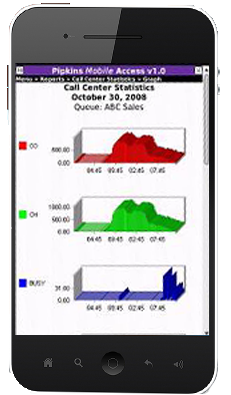 Dynamic color changes for the entire square or agent icon, showing whether the agent is in adherence, not in adherence, not in adherence but within tolerance, schedule to arrive within two hours, arriving or leaving within 30 minutes, or off. The size of the squares and icons makes the colors easy to see, even at a distance. One-click schedule updates from the adherence control panel, eliminating the need to navigate to separate screens to log schedule changes such as late arrivals, sick days or early releases. Users simply click "Schedule" in the non-adhering agent's square to access a menu of update options. Users can also view agent schedules and send popup and email messages with a click from the same menu. The next stage in the evolution of Mobile Workforce Management (WFM) is here. We've just introduced a new app-based mobile solution for iOS devices, SwiftPik for iOS.